Compression therapy includes measures of the outer -scale application of pressure in venous disorders, lymphatic drainage and burn scars. The focus is on the treatment of venous disease of the lower extremities. As auxiliaries compressive stockings, which must be at least knee length, for use . 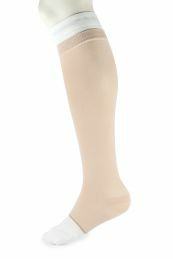 The LINDNER compression stockings are available in compression Class 1 and 2. By anatomic design, you have a perfect fit and secure so even after prolonged wearing a proper pressure pattern. The products used for the treatment of patients. Wear your compression stockings only after a consultation by a doctor . All LINDNER products are subject to product testing within our quality management system . Should you have any complaints about our product, we ask you to contact your dealer or us .